(Bedford Park, IL – June 25th, 2018) -- Litetronics proudly announces the introduction of its new LED Vapor Tight Slim Strip Lights, a family of uniquely rugged and low-profile fixtures that are ideal for space-constrained industrial applications requiring a durable and energy-efficient solution. 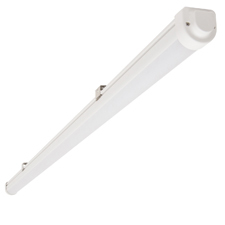 Available in 4’ and 8’ versions that consume 30 and 55 Watts respectively and deliver a powerful 130 lumens per watt, the line of fixtures optimally supports commercial, industrial, and institutional lighting needs within corridors/hallways, storage areas, stairways, parking lots, gas stations, car wash/auto body operations, and a broad range of other applications subject to harsh, wet, or otherwise challenging conditions. Measuring just 1.5 inches in diameter, the DLC Premium-certified fixtures’ slim IP67-rated design -- ensuring protection against dust, water, and other liquids -- is both impact- and corrosion-resistant. Rated for both indoor and outdoor use, the fixtures’ highly transparent UV-protected polycarbonate lens combined with rust-resistant mounting brackets ensures the delivery of bright, reliable, and uniform light output in some of the market’s most demanding environments, from car washes and factories to construction sites, outdoor installations with compromised air quality, and more. Fully-sealed with an extruded housing and tightly-fitted end caps, the Vapor Tight fixtures’ lightweight design – the 4’ version weighs only 1.8 pounds and the 8’ version weighs just 2.6 pounds – helps simplify installation on a wall or ceiling in just minutes. Among other user-friendly design features, the fixtures’ connection cable is pre-assembled to the housing with a water-tight PG cable screw; the fixture is subsequently installed by securing the mounting brackets to the wall or ceiling, then snapping the fixture into the brackets and tightening the brackets to the fixture’s aluminum base. From there, installation is easily completed by connecting the far end of the cable to the power; an optional suspension kit facilitates use in applications where a directly-attached fixture isn’t needed. Supporting 100-270 Volt applications and available in both 4000K and 5000K versions, Litetronics’ Vapor Tight Slim Strip Lights promote a clean aesthetic and feature a long 50,000-hour life and five-year warranty. In addition to standard wall and ceiling mount accessories, suspended-mount accessories are also available. Litetronics has been helping commercial, institutional, industrial, and retail businesses and energy professionals realize the benefits of high-performing, energy-saving lighting technology for nearly half a century. The company manufactures and markets a full line of LED retrofit kits as well as LED, cold-cathode fluorescent, fluorescent, metal halide, high pressure sodium, halogen, and incandescent lamps to meet the professional lighting market’s broad range of needs and is one of the industry’s most trusted sources of cutting-edge lighting technology. To learn more about Litetronics’ new LED Vapor Tight Slim Strip Lights, visit www.litetronics.com/led-vapor-tight-slim-strip. For information on any of the innovative new Litetronics® LED Retrofit products or Litetronics’ many other advanced-design, energy-saving lighting solutions, visit www.litetronics.com, contact customer service at (800) 860-3392 (toll free) or (708) 389-8000, or e-mail customerservice@litetronics.com.